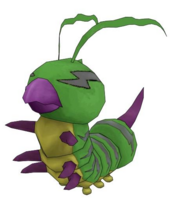 Difference between revisions of "Dokunemon"
|desc=Stings the foe with its poisonous tail, or jumps up and spits poison liquid at the foe. |desc2=Leaps on the opponent to stab them with its poisonous tail. |desc3=Summons a swarm of digital bees to sting the foe. |descl=Vanishes from sight, sparing it from enemy attacks. A Larva Digimon that, similarly to Kunemon, is studied day and night in an attempt to solve the mysteries of Insect-type Digimon. Because it has poison throughout its body, it is dangerous to approach. n.,v., A portmanteau of doku 「毒（ドク）」 meaning "poison" and kune, from kunekune 「クネクネ」, an onomatopoeia for "wriggling". 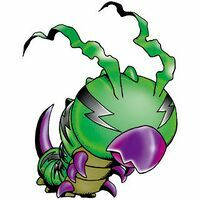 Anime/Manga Digimon Adventure V-Tamer 01: "Nightmare Battle"
Stings the foe with its poisonous tail, or jumps up and spits poison liquid at the foe. Leaps on the opponent to stab them with its poisonous tail. インセクトホード Insekuto Hōdo Bug Shower Summons a swarm of digital bees to sting the foe. キャプチャネット Kyapucha Netto Capturing Net Attacks by radiating light. Gitai  Mimicry 擬態 N/A Invisibility Vanishes from sight, sparing it from enemy attacks. Dokunemon is an enemy Digimon. It can usually be found in the Unwavering Forest. Dokunemon is an obtainble Digimon. 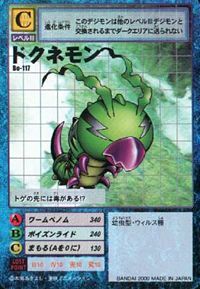 Can evolve to Flymon (0+ DP). 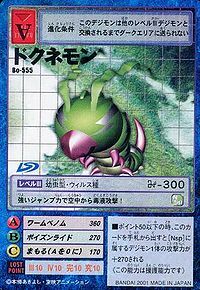 Dokunemon is an obtainable Black card. There is poison on the tip of its stinger!? It uses its great jumping power to unleash a venomous attack from the air!